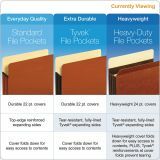 Rip-proof, 100% Tyvek® lined gussets. 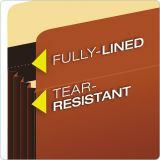 Super-tough Tyvek® strip reinforcement along all critical stress points on front and back covers. 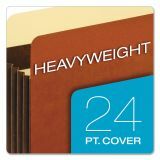 Heavyweight, extra-thick 24 pt. covers resist wear and tear. 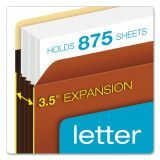 Letter / Extra-Wide / 3.50"
Legal / Standard Width / 3.50"
Legal / Standard Width / 5.25"
Legal / Standard Width / 7"
Letter / Standard Width / 3.50"
Letter / Extra-Wide / 5.25"
Letter / Standard Width / 5.25"
Letter / Standard Width / 7"
Pendaflex Heavy-Duty File Pockets, Straight Cut, 3 1/2" Expansion, Letter, Redrope, 10/Box - Heavy-duty, extra-wide file pockets are great for organizing your largest, bulkiest files and offer an alternative for limited drawer space. 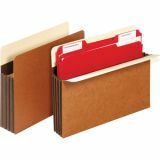 Gussets expand up to 3-1/2 to hold 875 letter-size sheets for your project needs. 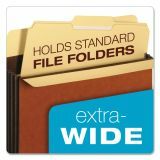 Heavyweight, 24 point front and back covers are extremely durable. 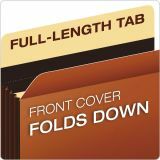 Fully lined, Tyvek-reinforced gussets with added rollover feature deliver wear-resistance and tear-resistance. Extra Tyvek-reinforcement inside the covers protect against tearing. 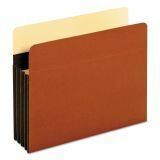 Full-length tab on back cover provides room for labels or handwritten titles. Front flap folds down for easy access.